Payday loans are very common all over Canada. It means you get a small loan, usually a few hundred dollars up to a couple thousand, and have to pay it back within a short time frame such as one or two weeks. The interest rates can be high, but the good news is that you can get approved for a payday loan right away, even with bad credit, and get your cash the same day. At Smarter Loans, we’ve compiled a list of the most reputable payday loan providers in Canada, which you can see below. Click “Apply Now” next to one of the companies to get started, or you can pre-apply right here at Smarter Loans and we will find the most suitable payday loan provider for you. We can help connect you with the top loan payday loan providers in Canada. A payday loan is a form of unsecured short-term borrowing facility that is lent out to retail consumers. In this type of borrowing structure, there is typically a repayment agreement that is activated in full when the borrower receives his/her next paycheque from his/her employer. All things equal, a payday loan generally has a higher interest rate attached to it because of its unsecured nature. Because the loan is non-recourse to personal assets of the borrower, the lender for such types of debt has to assume a higher rate of risk for every dollar lent out. To be compensated for this outsized risk compared to secured loans, there is a higher borrowing fee i.e. interest rate, charged. The principal amount of a payday loan is relatively smaller than other loans (generally in the $500 – $1000 range with an upper limit set by the federal regulator in Canada). In Canadian provinces and territories, these loans are mainly provided at retail stores or online by non-bank institutions that have to be registered with the Financial and Consumer Services Commission. The loans are mostly structured to be repaid in a single payment via a post-dated cheque or pre-authorized electronic debit for the full balance. Assuming that the borrower does not repay the loan early, the cheque is then cashed in or the debit is withdrawn by the lender. 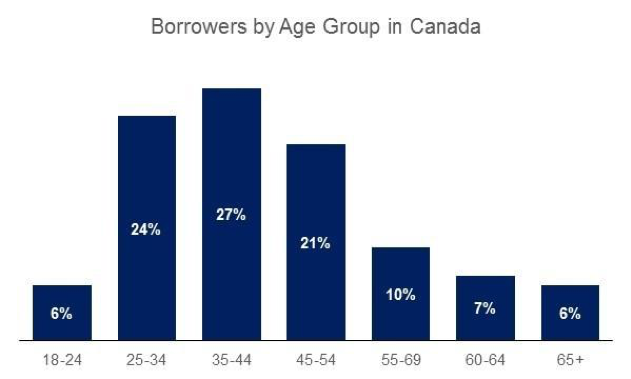 In Canada, the 25-54 year olds makeup over 70% of the borrowing population. Canadians in the 35-44 age range account for 27% of the borrowing. What is the difference compared to other alternatives? Type I is pretty synonymous with a payday loan where the lender provides a fixed principal amount that is tied to the borrower’s income and is intended to be repaid on the borrower’s next payday. Type II is a structured as a line of credit where the cash advance offered is dependent on the unused credit limits on the borrower’s credit card rather than on income. This type of cash advance is provided directly by the credit card company (not the issuer) and receives the same type of treatment as any other ordinary purchase made with a credit card. Depending on the borrower’s financial situation and credit card features, it may or may not be advantageous to have a credit card cash advance. Some key factors for borrowers to consider if choosing between these two options are current credit ratings and credit card contract terms with the bank. In some cases, credit card companies charge higher rates on cash advances than on ordinary credit purchases, so it is important for the borrower to understand the rate differential, and choose accordingly. The lender must be licensed and registered with the Government of the province they operate in, as well as fully compliant with the rules of the Payday Loans Act, 2008. Despite the higher interest, payday loans offer some of the following benefits over other types of short-term funding methods. Most payday loans are accessible to people who are above 18 years of age and have consistent, verifiable income. Conventional retail loans are offered with a specific purpose that is defined from the outset. An auto loan can only be used to purchase an automobile and a mortgage can only be used to finance a residential or commercial property. In most cases, the borrower has to provide a limited amount of financial information including proof of regular income, a bank account and a permanent address. In today’s market landscape, payday loans are available to anyone with an Internet connection. Conventional loans with longer timelines come with the risk of having to maintain a stable level of income for that period of time. Rinse and Repeat: Often, borrowers find themselves in a cycle of debt wherein each paycheque goes towards the pay-down of existing loans, leaving little for the operating expenses they took out the loan for. The extensions of the loans as a consequence come with strings attached in the form of higher fees added to the original amount. Predatory Practices: Non-sophisticated borrowers may be susceptible to lending practices that are intended to be unfavourable from the borrower’s perspective by exploiting contract loopholes or misleading marketing materials. It is therefore critical for consumers to find registered institutions that are vetted by regulatory authorities. Below you’ll find a list of reputable companies that offer personal and installment online loans in Canada. Take a look and compare your options, including products offered, interest rates, terms, qualifications and even reviews from other customers. When you’ve found the loan company you like, hit “Apply Now” next to the lender to start the application process.